I'm not a morning person. Not that I'm a grumpy bear before noon, it's just that if the sun isn't up, I don't want to be either. Turns out babies don't always subscribe to this school of thought though, so life with 2 under 2 is called "the early years" in every sense of the words. And as much as I'd like to blame them for our struggles in getting out the door on time in the morning...the truth is it isn't always 100% their fault. I mean, they definitely don't speed up the process, but occasionally my morning mosying is at least partly to blame. And on a week when we only have the baby (Piper is off visiting my parents) when it should be easy (easier?) for us to get it together, I still find myself struggling through the AM routine. Hear stirring, aka screaming, coming from the other room. Wipe the sleep from your eyes and retrieve the source of the wailing. Feed the baby. 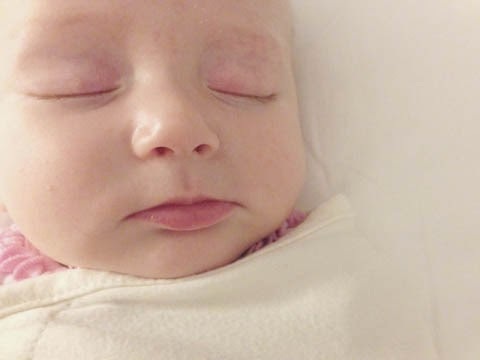 Accept the fact that the baby isn't nearly as sleepy as you. Remedy this by giving her to her father while you go back to sleep. Have ridiculous dreams involve you going wrong way on the turnpike causing you to run impossibly late for things, and generally have your life in shambles. Wake up and remember that wasn't a dream so much as it was a memory of two days ago, relived while asleep. Hear the baby crying, and ignore it for as long as anyone would reasonably believe you could still be sleeping through the noise. Eventually trudge out with a blanket offering to be helpful, but keep your eyes just closed enough to suggest that you won't really be helpful. While the baby is down for the world's earliest nap- Think about taking a shower, but not that seriously since you know you took a shower yesterday and come on, two days in a row? Who are you, the queen? Get dressed. Think about doing your hair, but not that seriously since it's raining out anyway so why bother with something that's going to get ruined. Instead, get back in bed and catch up on the seven status updates that have happened on Facebook since you last checked. Finally pry yourself out of bed two minutes after the latest possible minute you actually had to spare, and slick your hair back into a ponytail. Here the baby crying and see it as a blessing because it means you don't have to be the jerk that wakes her up, just to shuttle her off to "school". Watch as she falls asleep (again), and lay her down in your bed while you dig rain boots out of the depths of your closet. 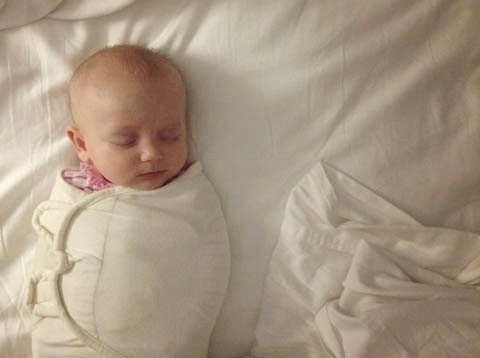 Notice how ridiculously adorable her fat burrito body looks on a big giant bed. Refuse, absolutely refuse, to disturb her, even though you're already ten minutes behind aand you haven't even ventured downstairs yet. 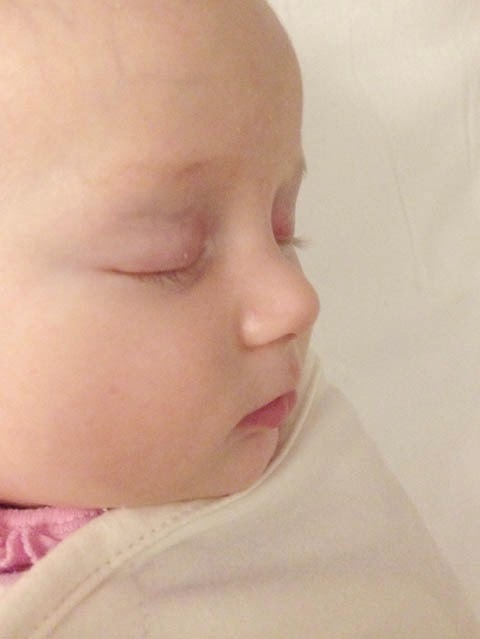 Take 1 million nearly identical photos of her sleeping angel face. 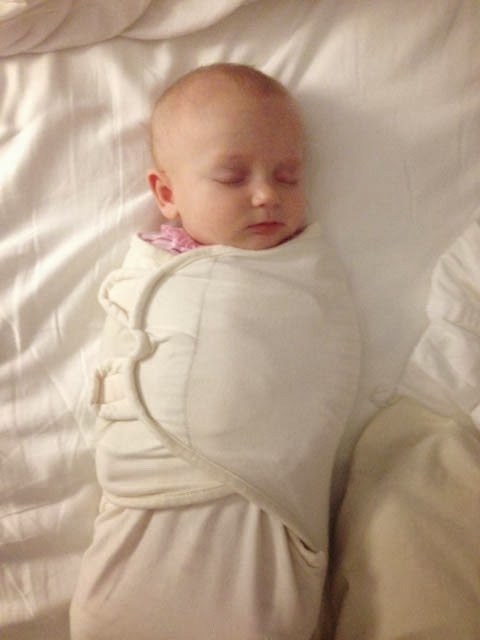 Finally unswaddle her, take her downstairs and place her gently in the car seat to coo and stretch while you get things ready to load up the car. Pull out the lunch your husband lovingly packed for you, and realize what you really want to eat is leftover pumpkin roll. Spend the last five minutes you don't have searching for matching a Tupperware container and lid to put it in, briefly contemplating just putting in your hand and/or pocket. Drive to daycare. Go in to daycare. Greet the day care ladies. Play with the daycare babies. Smooch your little nugget on the head and leave the daycare. Check in with your toddler who is having the time of her life at g'mi's house, while you're stuck in traffic. Apply enough make up to at least look awake. Respond to a text from a coworker who is also running late. Use voice to text (safety first!) resulting in a message that actually reads "excavation point" instead of including real punctuation. Circle, circle, circle the parking garage until you find an open spot on level eleventy billion. Forget your umbrella, but decide that you're lazier than you are vain so don't go back to retrieve it. Better to look like a drowned rat later than having to trek back up and down the steps again now. Arrive at your desk. Get some work done. Go home. Sleep a little. Start the entire cycle over again. I will never get over my shock at your ability to do so little with your hair, slapping on make up in the car and yet end up looking so glam all the time. Not fair. Some of us don't look as good when we put our make up on with a steady hand in the bathroom! Love the part about the pumpkin roll.